Michael Jensen - owner of Sacramento based Jensen Wedding Films, LLC - had planned on a career as a commercial photographer, following in the footsteps of his Father, Grandfather, and Uncles, who were all successful photographers. But after MichaeI took a video production class at Cosumnes River College after getting his B.A., he was hooked. He filmed his first wedding video at Harrah's Lake Tahoe on a Panasonic S-VHS Camcorder on Valentine's Day 1991 for $15. Since that day, Michael has filmed over 1000 weddings. He is nationally known as an innovator, and approaches each new wedding with a goal of improving on the one before. His filming and editing style has been characterized by his brides as "simple elegance." Mike strives to remain as unobtrusive as possible on the wedding day, and puts a premium on encouraging teamwork with other wedding professionals at each event. The finished product is a polished, hand-crafted wedding story that timelessly captures the love, emotion, and energy of your day. Your wedding film includes both a long-form documentary plus a spectacular short film. In August 2000, Michael won his first of several WEVA International Creative Excellence awards for wedding videography. He was chosen to judge the prestigious Creative Excellence Competition in 2004. In January 2007, Michael was voted by the readers of Event DV Magazine as one of the "Top 25 Hottest Professional Wedding and Event Videographers." "I was very excited to receive the awards," says Michael, "but the highlight of my career has been the joy on the faces of my wedding couples when they watch their beautiful wedding films for the first time." Jensen Films continued to push the creative boundaries of the wedding video industry. In 2006, he created and produced the World Record Wedding Video Event - and with his colleagues set a new World Record for the number of cameras to film a wedding ceremony (about 100!). The WRWVE later won a national NACE (National Assn. of Catering and Events) award for "Best Event Production." In late 2006 Jensen was inspired by Hans Nyberg's stunning 360-degree panoramas captured at the Danish Royal Wedding. Jensen Wedding Films remains one of the only companies in the world to offer HD wedding panoramas. In 2010, Michael custom-built his first Photo Booth, designed specifically for wedding receptions. He often incorporates the best high-resolution booth images into his finished wedding films. In 2012, Jensen Films was one of the first wedding videographers in Northern California to use radio controlled quadcopters (drone) for wedding work. 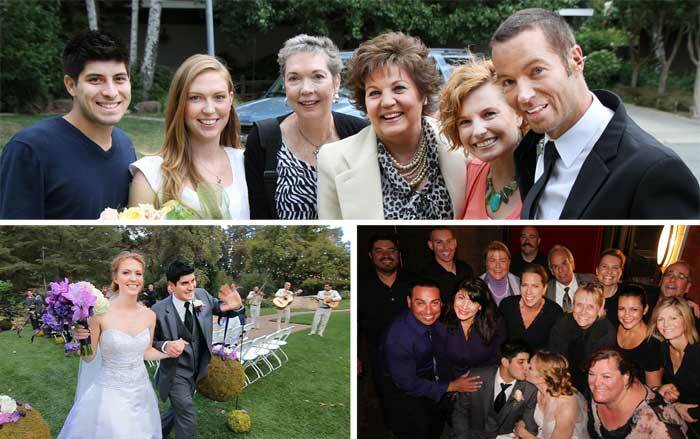 Jensen Films has since used it for dozens of his weddings and events with spectacular success! Michael has always felt that his talents are gifts from God, and that those talents should be used where possible to help those less fortunate. So, Michael helped produce the 'Wedding of a Lifetime' contest - a charity wedding for a couple that otherwise could not afford the wedding of their dreams. Sacramento NACE sponsored the event, which included the donated time and talents of several wonderful wedding professionals (seen below). On October 11, 2012 (yes- 10/11/12) Brittany & Daniel were married at Wilson Vineyards. In 2016 Jensen Films pioneered the development of Slow Motion Video Booths. Using super high speed cameras (filming at 180 frames per second), Jensen is able to create stunning short video's with the help of reception guests! View a great example of our Slow Motion booth HERE. 2017 allowed us to use the wedding and event panorama skills we have developed over the last 10 years in social media. Facebook and YouTube now support spectacular VR 360° panoramas that can be viewed impressively from your phone, laptop, tablet or desktop. We also created a new Facebook page of our VR panoramas HERE. We think 360 panography is a trend for future weddings. The panorama above was captured at Muir Woods National Monument in Mill Valley, CA. Mike's wife Pam has been a great support and has assisted in shooting weddings for Jensen Wedding Films almost from the start. His beautiful girls (now in their teens) help run the photo booths and are aspiring editors. Michael's family is the light of his life. "Each wedding takes on a life of it’s own," says Michael, "Every couple is unique - each has their own love story. I've always considered it an honor to capture what is often the most important day of their lives. I'm a bit of a hopeless romantic. I'm also passionate about delivering a finished product that my clients will be proud to share with their family and friends and enjoy for generations to come."